Effective Managers Disillusioned with Employee Engagement Surveys? You are Not Alone! CEOs and Heads of HR are increasingly skeptical about employee engagement surveys. If you are reading this article, you are probably in that same camp. How can this be? We all know how important it is to have engaged employees. The research evidence is overwhelming. As executives and managers in organizations, we don’t need research to tell us that engaged employees are better performers. Look at this figure published by Gallup’s State of the American Workplace 2010-2012. Since the Year 2000 employee engagement has hovered around 30%. I don’t have access to the original data to be certain, but as a researcher my eye tells me this is a remarkably flat trend line. About 30% of the American workforce have been engaged throughout this period of time. That means that 5 out of every 10 workers is coasting and 2 out of 10 are actually working against the organization that employs them. And it has not changed significantly since the turn of the century! We know engagement is good. 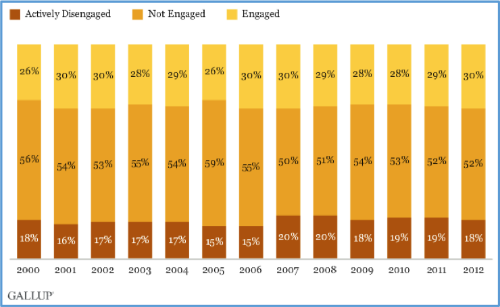 Organizations with higher levels of engagement are higher performing. We have the ability to measure engagement factors. Surely those thousands of organizations doing the measuring are taking action to change things? And yet there is no significant overall improvement – no significant increase in engagement; no significant decrease in active disengagement. No wonder there is disillusionment in the executive offices! Employee Engagement Surveys are measuring symptoms in organizations. They are actually doing a pretty good job at measuring these symptoms. We know higher engagement is related to better performance, so we are measuring something that matters. But just as giving an aspirin to treat a fever provides symptomatic relief, organizations are treating the symptoms of poor engagement. Certainly, they get some immediate relief, but the underlying disease, the root cause, is not being addressed. Just as the fever will come back if you don’t treat the infection, the symptoms of poor engagement come back when you stop the interventions. These are real issues. They are flagged as poor communication because that is the best language the employees have to describe the situation. When the executive management team sees “poor communication” in the results of an employee engagement survey, the correct course of action is not to publish more newsletters or send more memos. Poor communication is a symptom of a deeper root cause problem: the absence of a formal accountability and authority framework. The employees may express a lack of communication, but the real issue lies in the managers who have failed to establish and maintain open and working channels with their employees. The information, through context setting and delegation, needs to be provided in the right size and at the right time to be meaningful to an employee. Only a manager can do this – it cannot possibly be done centrally. The proper recourse is to ensure that a smoothly operating accountability and authority framework is in place to ensure that work is clearly delegated down the organization within context that is appropriate for each employee. Again, the root cause is not poor collaboration. There isn’t a lack of willingness for colleagues to support each other; there is no innate desire to sabotage co-workers. The root cause is that the organization does not have an accountability and authority framework in place for how work flows across the organization. When the executive team sees “poor collaboration” appearing on employee engagement surveys, the root cause lies in the systems for doing work – not necessarily in the employees themselves. The intuitive reaction to these findings is to create team-building exercises for management. But this isn’t about team building across functions… it is about the absence of an accountability and authority framework for delegating the flow of work across the organization. An effective manager supports others in the organization, monitors workflow, and ensures that the day-to-day work of his or her staff is improved by working together, rather than by working in silos. This can only happen within a framework that is set by the CEO and within common context throughout the organization. When the CEO establishes a clear accountability and authority framework for the action and interaction of staff, work will flow more smoothly across the organization, conflict will be reduced, and the silo mentality will be broken. There is only one way to attack the symptoms of employee disengagement in an organization. In most circumstances, the problems staff identify are caused by problems at the management level. For employees to be engaged, managers need to manage! And this requires an accountability and authority framework that is clear and implemented down and across the entire organization. How much accountability do managers feel they are carrying? How clear are managers about their accountability – for delivering objectives and for managing subordinates? The Effective Managers™ Survey is a great tool for CEOs and HR to diagnose managers’ effectiveness. This research-based survey can get to the root cause of issues in the way that an employee engagement survey does not. When an organization works to improve the accountability of its management team, employees feel more engaged in their work – and that leads to a more productive organization.